Despite the latest interest and press about the resurrection of traditional heavy metal, most fans, who know their history, know that classic heavy metal has had a huge following in South America. International bands like Iron Maiden and Rush or native bands like Sepultura are reigning metal gods throughout the continent. Therefore, it is no surprise that Brazil's Hazy Hamlet with their debut, Forging Metal, should cross our global metal radar. This crew does it old school with a galloping rhythm section, vintage gruff metal vocals, and fiery guitar solos over a minimalist production. If this were 1982, Forging Metal would have been the rage for tape traders around the world. However, while it's solid stuff from beginning to end and even though I'm a huge fan of this genre, Forging Metal never pulled me in and held my interest, at least not until the last several songs. Certainly, I can point to several songs including Field of Crosses, Chrome Heart, Chariot of Thor, or Forging Metal as highlights. Yet, with one listen I had heard enough. I think I tired of the ever present shouts and the overall lack of melodic hooks. I didn't feel the need or desire to play it again, but I probably will because I think Forging Metal will grow on me. In the end, however, Hazy Hamlet delivers the goods, and Forging Metal is a fine example of classic genre that put heavy metal on the map. 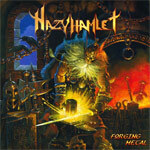 Hazy Hamlet delivers the goods: Forging Metal is a fine example of classic heavy metal.